Combine GPS tracking data (from devices attached to the birds) with weather and terrain information from other sources to create a big data approach to analysis of migration patterns. "The new Environmental-Data Automated Track Annotation (Env-DATA), detailed in the journal Movement Ecology, can track millions of data points and serve over 100 scientists simultaneously. Researchers used Env-DATA to analyze the flight paths of the Galapagos Albatross in a case study of the system’s application. Scientists were able to track the GPS signatures of individual birds, as well as collect satellite data on weather patterns and glowing chlorophyll concentrations in the ocean associated with food sources. The birds’ chosen paths took them to preferred locations on the Peruvian coast where they could forage. 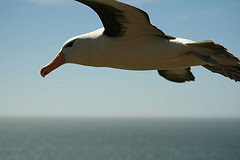 The researchers found that the albatrosses took a clockwise route, allowing them to take advantage of tailwinds on the long journey. Env-DATA also simplifies the tedious work of data manipulation for the researchers, condensing work that used to take graduate students countless hours into only the click of a mouse." Labels: Eye on Apps, Misc.